Oscars: Has anything really changed since #OscarsSoWhite? Last year, the #OscarsSoWhite controversy cast a shadow over the Academy Awards - it was the second year in a row when the acting nominees were all white. This year, things are different - on the surface at least. 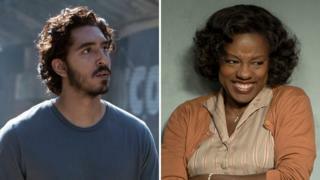 Seven of the 20 stars up for acting awards at Sunday's Oscars are not white, and the Academy of Motion Picture Arts and Sciences, which organises the awards, has taken steps to broaden its pool of voters. There may be more visibility for black actors and stories - but the diversity debate has also highlighted problems with how Asian, Latin and Native Americans are represented. So are things getting better? Have the Oscars and the film industry turned a corner, or are the movies still struggling to reflect the real America? We asked a few actors, film-makers and industry figures. How diverse are this year's Oscars? Last year, Def Jam Records founder and film producer Russell Simmons set up the All Def Movie Awards to recognise the films that Oscar forgot. They returned this year, with tongue-in-cheek categories like best superhero token sidekick and best Latino not in a service industry role. Simmons says he staged the ceremony again because "there's still a lack of sensitivity on the part of the gatekeepers". "I think people are making the best efforts possible and I don't think any of it's intentional. "Of all the industries I've worked in - and I've worked in pretty much every industry - I think Hollywood has the best intentions. But you need activists and shows like this to keep reminding them." Hollywood's gatekeepers "don't have any friends of colour, and they're in charge", he says. So they need to reach out to different communities. "The emphasis [must be] on making friends and communicating and sharing common threads and common dreams and common sensibilities. That's what Hollywood's lacking. "There is a black Hollywood - it has to exist - and there is a white Hollywood that doesn't realise how white it is. And they're not breaking their neck to get the voices in the room that will make them a better Hollywood." Actor, rapper and YouTube star Timothy DeLaGhetto was at the All Def Movie Awards to hand out a prize titled best performance by an Asian not asked to use an accent. It is difficult find roles that break out of stereotypes, he explains. "It's definitely a struggle for an Asian dude trying to play regular people," he adds. "I actually just turned down an audition today for a nerdy part. I thought, nah, I'm not going to be the nerdy Asian guy. I feel like we have enough nerdy Asian guys. "So I'm just here trying to be a regular person and there's not a lot of opportunities for a dude trying to be a regular Asian dude. But I'm trying. "It's a slow process. Gradually Hollywood is beginning to learn that it's important to have some representation and it's nice as a younger Asian dude to see more and more Asian dudes popping up here and there. "That's really the reason I got into it - because I didn't see anybody who looked like me on TV, unless they were doing kung fu or the math whiz in the class." Actress Bresha Webb - known for TV shows like Love That Girl! and ER and last year's film Meet the Blacks - says things are "on the up and up". And that is reflected in this year's crop of Oscars films. "We have Moonlight nominated. We have Hidden Figures," she said. "I think things are moving in the right direction. I think the uproar that happened last year was necessary. "Also movies like Lion made an impact this year, and we need to give accolades and reward movies that say more about the world that we live in, and not just one specific, and I think we're doing a better job at that. "I applaud the Academy for making room to show more directors and new ways of telling stories and new people. So I think we're making a great move in diversity." Film producer Carolyn Caldera told a BBC News Facebook Live that there's a major problem with stereotypes of Latin Americans in films. "For us as Latinos it's been a problem in pulling away from depicting us as maids and people who work behind the scenes, and not enough doctors and lawyers and judges," she said. "So that's a challenge - bringing these to the big screen. "Many of us independent film-makers are looking to create a hero for the Latino demographic. "More than ever we have a responsibility to create hope and depict an icon for our people because there's a lot of fear right now in our community. As producers, it's our responsibility to tell a story, to tell it well and show the best side of our culture." Maya Solis is the manager for Native American and Indigenous programme at Sundance Institute. "A lot of financiers feel there isn't an audience for Native American films and I would disagree with that," she contends. "The majority of the key roles are being written for white actors and that's an obstacle and an issue which is depriving non-white talent of having these key roles and getting that lift to their career. And you need to have the talent in front of the screen and behind the screen as well. "There's this question of - do we need to be validated by a system like the Oscars? That's a very western colonial thing. Or can we simply make films for ourselves and to share with audiences to share our experiences?" Andrew Ahn describes himself as a queer Korean-American film-maker, and his debut drama Spa Night is nominated for two Independent Spirit Awards, which are handed out on Saturday. He says he was told he would find it easier to get funding if he had a white character. "A lot of American independent cinema financing relies on star power, so trying to find investors and producers for Spa Night, we came up against a lot of push-back and feedback on how I should write in a white character so we could get a star who could help finance a film," he says. "If it made sense for a story, then sure. But it didn't make sense for the story. I really wanted to tell the story about the Korean American immigrant community. "So the difficulty was systemic - from financing to casting to finding locations. It was less one evil individual and more the fact that it's really difficult to make films about people of colour and marginalised communities for many different reasons. "There is a sense that more traditional structures of making films are creakily adjusting and trying to hit diversity as something to check boxes. But where it does feel like a genuine effort is from film-makers within these communities who are trying to tell these stories." Actor, writer and director Christopher Naoki Lee, who has appeared in TV shows like Legends of Tomorrow and the Hawaii Five-O remake, says progress has been made in the past decade. "Ten years ago, the opportunities were much less because there were more stereotypes," he says. "It was more about as an Asian-American they might be the nerdy type or the quirky type or the comic relief. "So for us to begin to break that mould, I think that's fantastic. Allowing for myself not just to be seen as somebody who studies a lot or is an engineer of some sort - to be asked to play different roles, that's the direction we're moving in and that's fantastic." Oscar nominations 2017: How diverse is this year's line-up?